OPEN DISCORD SERVER! PRIMARILY FOCUSES ON BBTAG BUT IS ARC SYSTEM WORKS FOCUSED. Blazblue/Guilty Gear/Dragon Ball FighterZ/Granblue Verus/RWBY/Persona/Arcana Heart/UNIST/Melty Blood/Fate! The collision is inevitable. The impact will be unavoidable. An endless space that creates Memory Fragments from those who are there, and scatters it throughout its multiple levels. 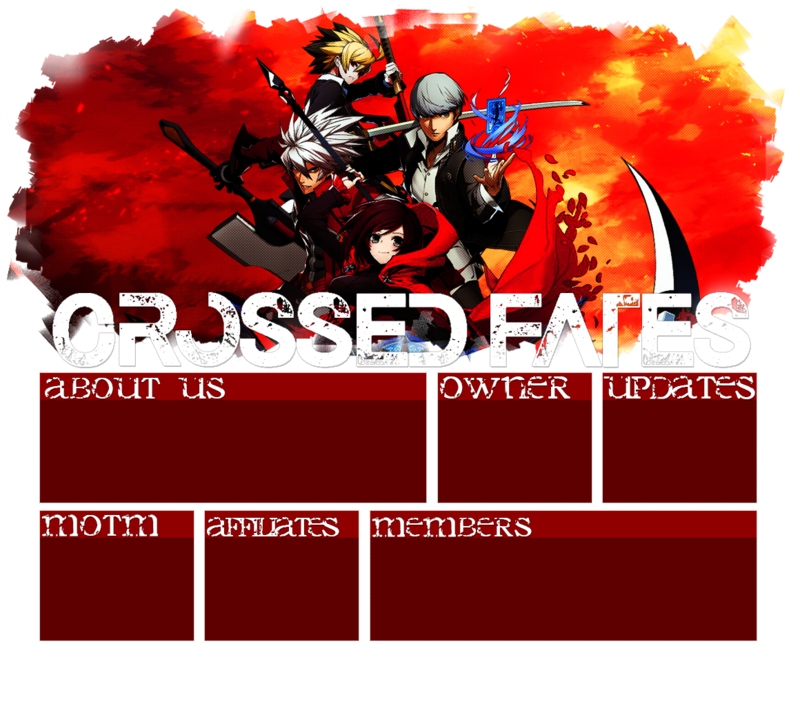 The purpose of this roleplaying group page is to serve as a directory for those within the Blazblue, Persona, Night In-Birth, and RWBY roleplaying communities. A group writing project is currently being implemented. If interested in joining, please feel free to message/comment this page! We also do have a discord group available for everyone! Like many, I was very excited about the announcement of Blazblue: Cross Tag Battle but once the game initially launched, the roster left a lot to be desired. The game missed the mark on fan favorites from each established series and the story was a tad bit on the weaker side. The boss is essentiality a gacha crystal or something. Nonetheless, I appreciate the mere existence of CROSS TAG BATTLE and wanted to do one big story before I hang it up. I'm looking forward to the development of the game and whatever additional fates it adds to the mix and I'm very much looking forward to collaborating with you all. CAN'T ESCAPE FROM CROSSING FATES. It's definitely a pleasure meeting all of you. I certainly hope that we get along famously. This project has brought me close with talented people and writers from other verses. It's definitely a fun experience! I look forward to crossing fates with all of you! 06.21.18 Bang and Yukiko conceive the idea. 06.22.18 Bang and Yukiko became Admins. 07.01.18 Group Page is kicked off. 07.07.18 Roleplayer Directory is set up. 08.16.18 Other fates are now known as Assists. 09.30.18 RPG page goes live. 10.01.18 Hyde was selected as Member of the Month. 01.01.19 Project is reinstated, after short hiatus. 01.01.19 Hilda is chosen as Member of the Month. Hey there, and welcome to Scattered Dreams! A brand-new Kingdom Hearts roleplay group. We’re a multi+ writer group, with fun and exciting group activity games every month. We’ll have a group roleplay in our ani blog, once we get enough members to join. If you’re interested in joining, please check out our rules, the rules are pretty straight forward. Once you read and sign the rules, fill out the audition form in messages. If you have any questions, I and Axel will be glad to answer any questions you have, just comment or message us here. If you are a fellow roleplay group or resource site, and wanting to become affiliates or a sister site with us, just let us know! We’ll be glad to become affiliates with fellow rpg, and resources site. We promise to share you all out once to three times a month, rather it’s in bulletin or in stream. We also agreed that sister sites will be able to participate in our group games, however you must have been on this site at least two months to become a sister site with us, and we only accepting a few sister sites at the moment. So, if you’re interested, let us know! We really appreciate your support and look forward to seeing what your creativity can bring about. Whenever your muse is strong, feel free to stop by and audition with us, or even if you'd just like to see what we're up to! Until then, sweet dreams.